A 3-RBI performance from second baseman Eddie Wheeler, the 19th overall pick in the 2033 draft, led the North Carolina Aviators to a 9-3 win over the New Jersey Athletics. Dean Edwards earned the save for North Carolina, his 1st of the year. With their winning streak at 4, the Aviators have raced to a strong start this season. Shane Schute, who is tied for 4th in the PL in bases on balls with 8, aided the North Carolina cause with a run-scoring sacrifice fly in the top of the third. 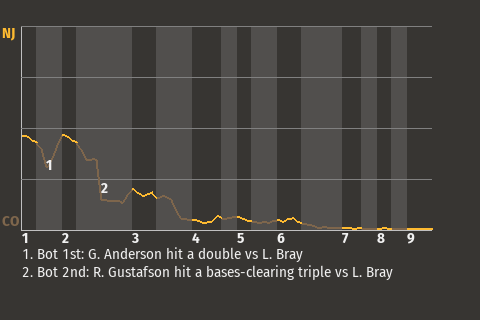 For the game, the designated hitter went 1 for 2 with a double, a walk, and was hit by a pitch, while adding 3 RBI. "I was able to barrel up some pitches," said Wheeler. Special Notes: RP Dan Peters was injured while pitching.